The new Commissioner of the Port of San Diego says it's time to upgrade the Coronado Ferry Landing. 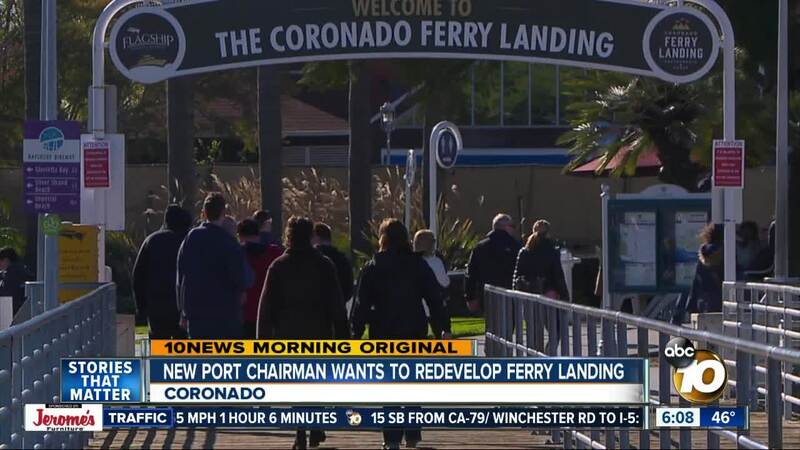 CORONADO, Calif. (KGTV) - Big changes could be coming to the Coronado Ferry Landing. The new Chair of the Port of San Diego Board of Commissioners says it's time to upgrade the 35-year old business district that has restaurants, shops and bike rental stores. "What I'd like to see is understated elegance," says Port Chair Garry Bonelli. "When people come to the Ferry Landing, whether they're visitors from here or from around the world, I want them to go, 'Wow, what a spectacular place.'" Bonelli says the area would need an upgrade to keep up with all the other parts of the bay that are undergoing significant improvements. He points to the Embarcadero, the Chula Vista Bayfront, the new symphony performance space, the new boat ramp on Shelter Island and other projects as evidence of what can be done. "We need to think more imaginatively," he says. "What could this area really be?" Bonelli says most of the leases at the Ferry Landing still have 7-10 years left before they run out. But he says projects like this take years to plan and approve, so now is the right time to start. But not everyone's on board with the idea. Recently, a group calling itself the Coronado Public Safety First Collaborative released a pair of statements saying they're opposed to the idea of redeveloping the Ferry Landing. They say it would attract crowds that would put more stress on traffic, police and firefighters, infrastructure and more. They also say any new upgrades would have to go through a California Environmental Quality Act (CEQA) review. Bonelli says he wants to work with the city and the people living there to make sure whatever happens fits. "I don't want to scare my fellow residents here," he says. "The most we have here now is two stories. I don't see anything bigger than two stories. If we can have a development where residents can enjoy it, leaseholders can have a quality business and our visitors can have a special place to come and say, 'Wow, this is spectacular. I want to come back again and again and again.' That's what we're looking for."